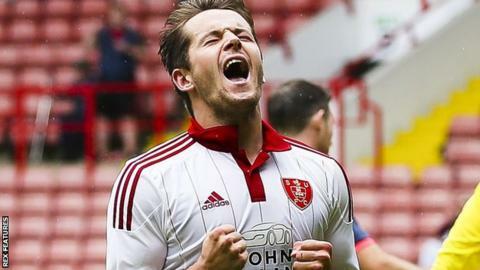 Portsmouth have signed Scottish striker Marc McNulty on an emergency loan deal from Sheffield United. He will initially remain with the club until January and has signed in time to feature in Saturday's FA Cup first-round tie against Macclesfield. The 23-year-old joined the Blades from Livingston in the summer of 2014 having scored 45 goals in 117 appearances. He scored the winner for Sheffield United against Southampton in the League Cup quarter-final last season. "It's not often that such a big club wants you to play for them and I'm determined to take advantage of that," he told Portsmouth's website.